An elegant depiction of days to come, these rehearsal dinner invitations feature the phrase "before they are Mr. & Mrs. join us for a rehearsal dinner." Customize design and wording to fit your celebration's colors and style. 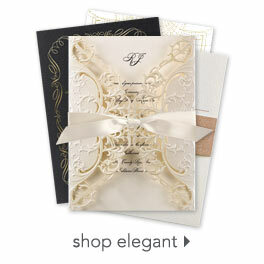 Envelopes are included with these rehearsal dinner invitations. This product features thermography printing. Thermography is a unique printing technique that results in raised lettering you can feel, which adds to the luxurious experience of this printed piece. So pleased with these invitations! The paper, the printing but most of all the service!!! We had a little problem with the finished product and immediately Invitations by Dawn responded to help make things right! I am so pleased with this experience!